This will be on Monday, Wednesday and Friday only, with very limited passages available of two each day, each way, providing staff is available as all boats must be accompanied. 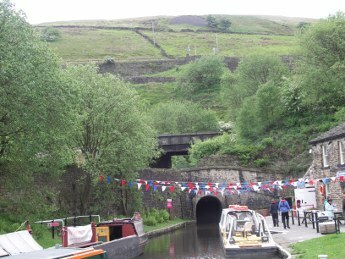 The passages are only available during the boating season as the tunnel is closed during the winter, that seems a very poor return on the £32millions the restoration of the Huddersfield Narrow Canal cost, especially as it is all too often the subject of stoppages, it not being properly maintained since it was re-opened in 2002. However boat trips for visitors are available, starting this week-end to coincide with the half term school holidays with a 30 minutes cruise from Friday 15th February Monday 25th February inclusive. The dates of further boat trips have not been yet announced.